We were told that when the city had Norm Kelly (who has the charisma of a damp rag and the appearance of a low-grade bank clerk) appointed Deputy Mayor, that the man would be the political leader for millions people. The man that would represent all of us at city hall. The man whose job was so important that of course he would need more power then the elected Mayor Ford. The question that I want to ask – the question that we all should ask is: Who is Norm Kelly? I’d never heard of Norm Kelly, I never was allowed to vote for him. I would like to ask Norm, who voted for you? 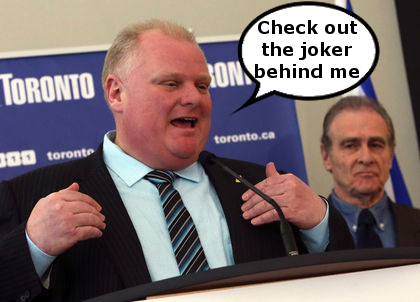 And what mechanism do the people of Toronto have to remove you from office? Oh, I know democracy is not popular at city hall these days! Those are the questions Toronto’s lefty clique will never answer. Heck if it was up to Dictator Kelly you would not be allowed to ask those questions in the first place. They seem to think they have the power to remove the elected mayor, while their puppet ruler is untouchable! We as a Democratic Society are a shamed and appalled at the 37 Councillors who voted to take Ford’s powers away. The way they acted it is obvious they support the Ideologies of Dictatorship, Fascism and Communism. It is so shocking to think that 50 to 80 million people have died for Democracy and these councillors couldn’t care less! The 37 councillor’s actions have brought so much shame to Toronto’s City Hall. How could they spit on the graves of so many and turn their back on Democracy!! Also, a point to consider is most have ties to the Liberal Party which in my view starts to make this whole thing look like conspiracy. I feel the RCMP should investigate these councillors for Democratic Terrorism. They have started to act and become no different then, any organized crime syndicate. They are starting to act like Terrorists as they destruct the Democratic process. The process that makes us free!!! We should all be scared, very scared. Rob Ford please keep standing up and fighting these evil minded councillors who have become moral corrupt by supporting the Ideologies of Dictatorship, Fascism, and Communism.